Desierto Sur by Shawn Garry . :FILM SHARKS :. 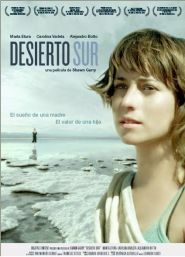 Sofia is a young Spanish girl who loses her mother to an illness. An enigmatic letter falls into her hands, one that her mother sent to Chile when she was alive. The letter is returned by the post office when the recipient could not be found. The content of the letter raises stirring questions in Sofia, who then embarks on an adventure filled journey south of the world. The destination: An unknown and remote town called 'Desierto Sur'. Marta Etura; Alejandro Botto; Carolina Varleta; Ernesto Malbrán; Héctor Noguera; Héctor Morales. Marta Etura (Dark Blue Almost Black; 13 Roses ; Vientos de Agua).